I decided to do my 6th Night retreat day on Sunday – a day after most people did theirs. I wanted to dedicate a full day to it unlike the week before where everything felt rushed and half-assed. I removed the usual distractions from my life and focused on my spiritual studies. It was difficult at times but I’m proud of myself for doing it. 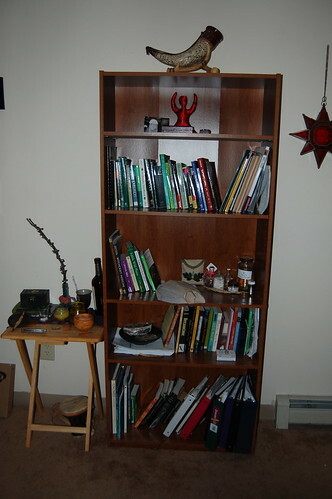 One big thing I did, with the help of my husband, was set up my new bookshelf. It’s nothing fancy – just a flatbox shelf – but I desperately needed new space for my growing collection of occult books. It’s also a nice place to store potions such as the triple water mixture I made and the salve I ordered from Sarah Lawless. I also made room for an ancestor shrine. I do have photos and a candle sconce on the wall for that purpose, but I needed a place to put food offerings at certain times. I also wanted to put the ancestor doll I made to good use! I’m enjoying the spiritual activities. I’m especially fond of the morning charm and the Breath, Blood, and Bone meditation. The latter is very, very calming! I found myself doing it today under stress at work! I’m not sure what to do this weekend because of the Spring Equinox at Muin Mound. Should I call that my retreat day or should I do it on Sunday? My worries are that Druidism will eat up an entire weekend and, while that’s not a bad thing (I live and breathe it after all), my non-Pagan husband does want to spend some time relaxing with me over a movie or game. Thoughts? I performed mine on Monday due to my schedule. I will say that later months will make it more difficult to spread the retreat over several days. Also I think that it detracts from the purpose of the 9 Moons. Think of this as magical bootcamp. You may never work this intensely again, but you will be forever changed by it.